It’s still summer, but for college hockey fans the season is just around the corner. One of the newest teams to the Division One ranks has been the Arizona State Sun Devils who have officially unveiled their new uniforms for the 2018-19 season. The new uniforms mark provided by Adidas have given the Sun Devils an updated home and a completely overhauled road uniform. 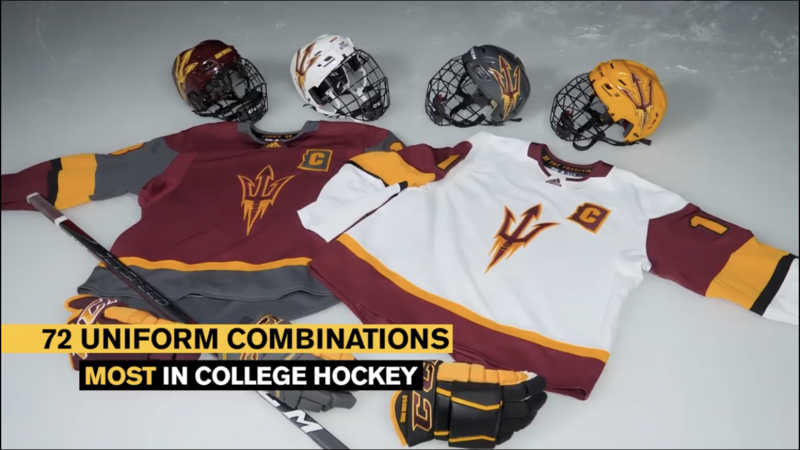 Event though there are just two uniforms, according to the ASU athletic department the hockey team will have 72 uniform combinations with four helmets (maroon, white, gold, and gray) along with three pairs of gloves pants (maroon, black, and gray). Let’s take a look at what’s stayed the same and what changes have been implemented. ASU will have 72 combinations of uniforms for next season. First the main crest on the uniform has remained the same with the devil’s pitchfork. This was a great logo in the middle of the uniform and I am really glad they kept this. The home uniforms remain a classic white color as opposed to going to a colored home uniform like Quinnipiac University that wears a gold uniform for home games. One minor feature that remains the same is the captain’s crest with the state of Arizona as the background. This is a nice subtle detail that I can see other state university’s copying in the future. ASU’s old home uniforms. the school has changed the main logo color and dropped the ASU shoulder yokes. There is a lot of changes to the ASU uniform set. First let’s start with the minor changes. The main logo on both jerseys is now a red trident with gold piping instead of the old combo which was the opposite last year. While it still pops on the white, I do think the gold trident would pop better rather than a maroon crest on maroon jersey. From the top ASU has added four new helmets to the set each with the trident logos. Last season the team had a gold and red helmet but will now add grey and white helmets to the set. The piping on the sleeves and socks have changed from a classic three stripe to now a layered look of red, gold, grey, and black. This style is very similar to what the Vegas Golden Knight Uniforms look like. Each jersey also features the state of Arizona embroidered under the back collar above the name plate. ASU’s new road uniform not only has a new color, but continues to focus on the minor details. The biggest change is the road uniform which drops the former black uniform in favor of a maroon uniform. This uniform features gold numbers and uses grey as the secondary color saving the gold as an accent color with the black. Overall this is a sharp set of uniforms with ASU quickly becoming the Oregon of college hockey with their multiple combinations. Don’t be surprised if other schools follow suit with additional helmets, gloves, and pants to pair with their uniforms. Really my only complaint is that despite the combinations the team only has three uniforms. While they gold have easily added a gold or dark gray uniform to the set, personally I wish they kept their sharp-looking black road uniforms as an alternate. These were some of the sharpest uniforms in college hockey and the red, gold, and black combo was not only sharp but the black made the maroon and gold really pop. Hopefully the team can bring these back next year as a third uniform because this was the program’s best uniform.